“Four kinds of locusts were edible. …We learn from the Arabs of our day how locusts are dressed for food. Sometimes they are simply roasted and eaten with a little water and salt….But usually, the preparation was more elaborate. After killing the locusts, they were dried in the sun; the head and claws were taken off and the body ground to a powder, either by a mill or in a mortar. Flour was mixed with this powder, and it was made into a sort of bread slightly bitter; camel’s milk or honey was added to correct this’” (page 21). 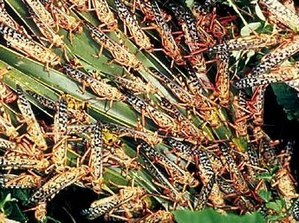 Locusts are commonly eaten in some parts of the world today. Mine is a life-long interest in the women of the Bible, and I enjoy exploring the world in which they lived, and discovering the challenges that they faced. I have enough curiosity about them to last the rest of my life. if like to read it then my friends will too. Thank you. We’re happy you found us!